Most of our operations are moving to Toronto in 2 weeks. There are many exciting benefits for you (and us)! 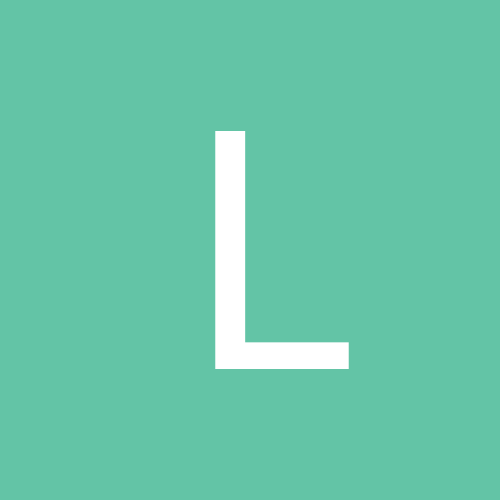 New Significantly Improved Shipping Services - faster AND WAY cheaper! For most of you, the #1 benefit is we will be offering USPS shipping (!!) and our shipping costs will be cut in HALF (!!!) for most parcels to the US! We will be offering First-Class and Priority shipping (flat rate and not). All USPS services are 2-3 days in transit and USPS delivers on Saturdays in some locations. As soon as operations are shut down in Saskatoon (see Logistics below for details) the shipping options will be adjusted on our site to reflect the new location and we will make a detailed post with more info. This change benefits both US and international customers as, ironically, using USPS to ship internationally is cheaper than using Canada Post in some cases. We will still be offering UPS services - in fact with the move we negotiated a further 10% off UPS ground to the US rates that will be implemented with the move. I am not allowed to tell you the rate we pay according to our contract - suffice it to say I have been asked to negotiate someones mortgage as a result of the awesome contract we have. We will still be offering Canada Post for Canadians and the benefit is that the Ontario location reduces the price to far more postal codes and people than shipping from Saskatoon. More Space = More New Products! 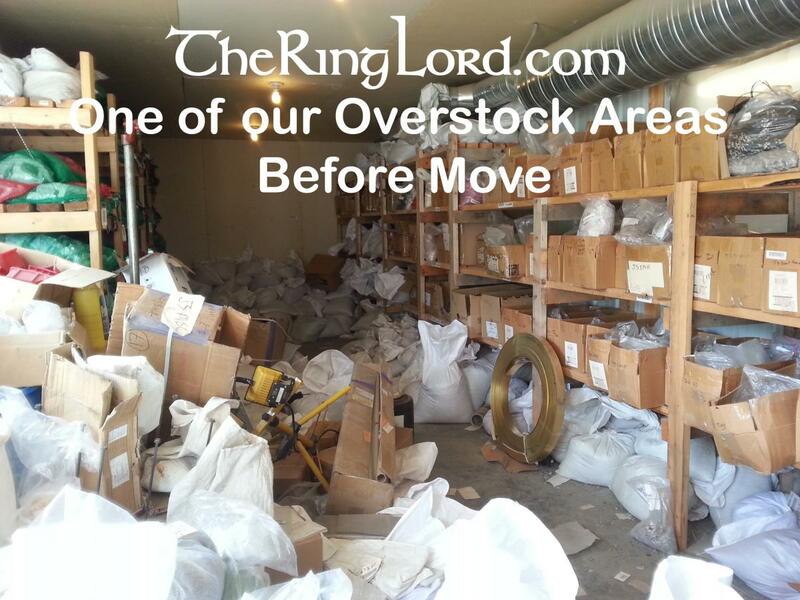 We are completely out of space in Saskatoon - we do not have a single inch of space left in our shipping area, manufacturing is bursting at the seams and our overstock storage is filled to the gills. I have attached a few pictures of the situation to make this point for me. 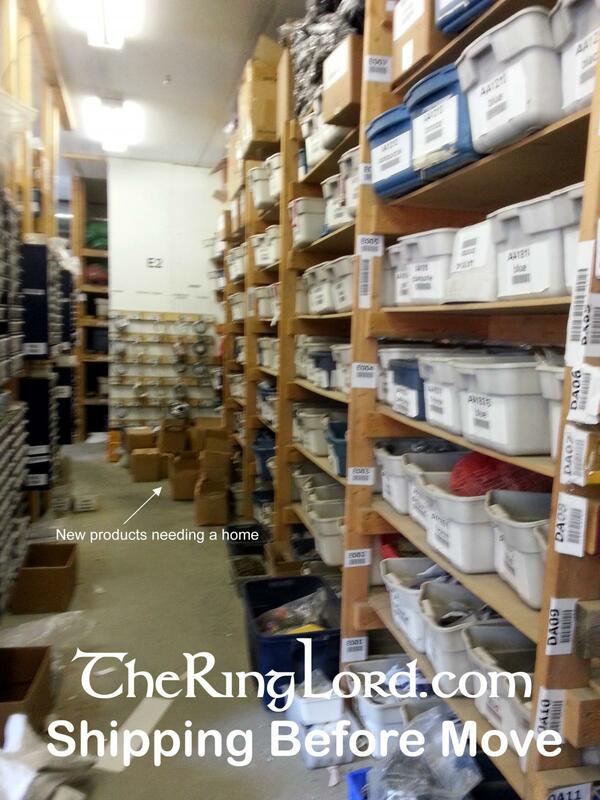 If we add 1 size of anodized aluminum rings it takes 17 linear feet of shelf space in shipping and 30 cubic feet of overstock storage. 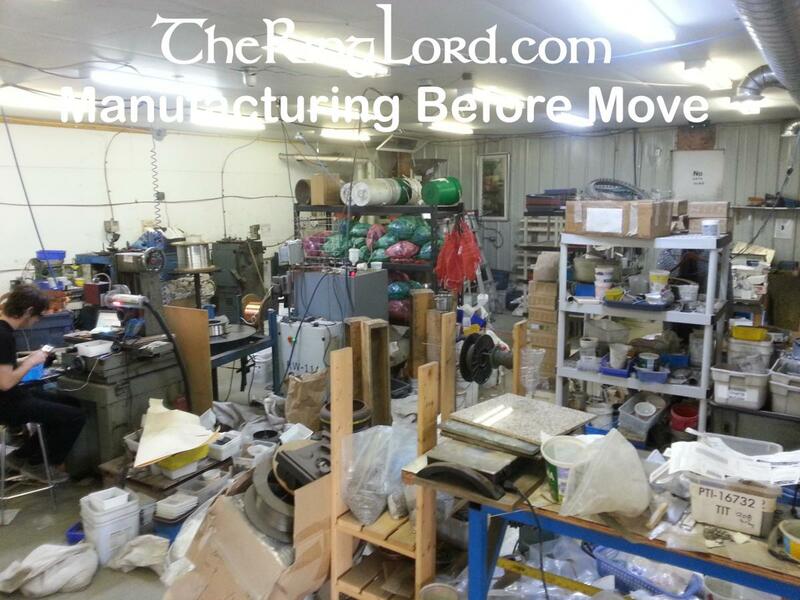 We have over 1500 square feet of shop space dedicated to anodized aluminum overstock alone. 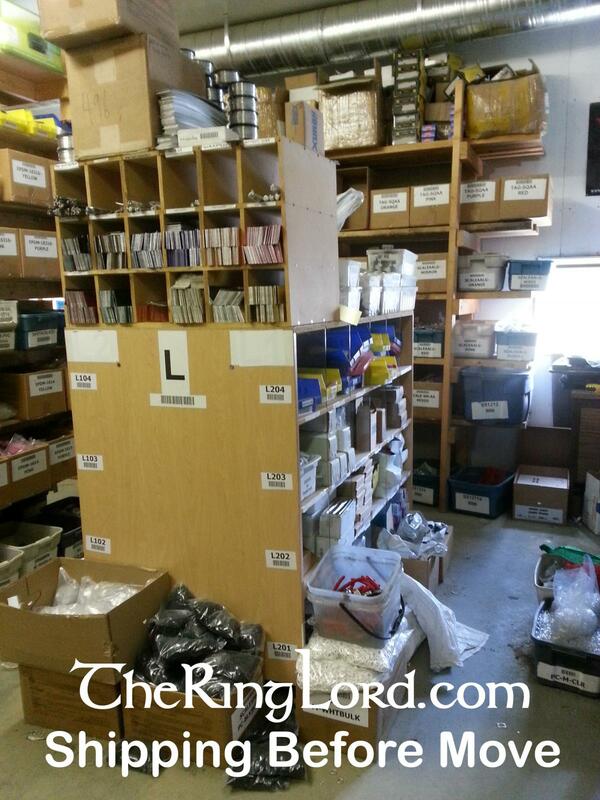 With almost 6000 skus, we need more space! 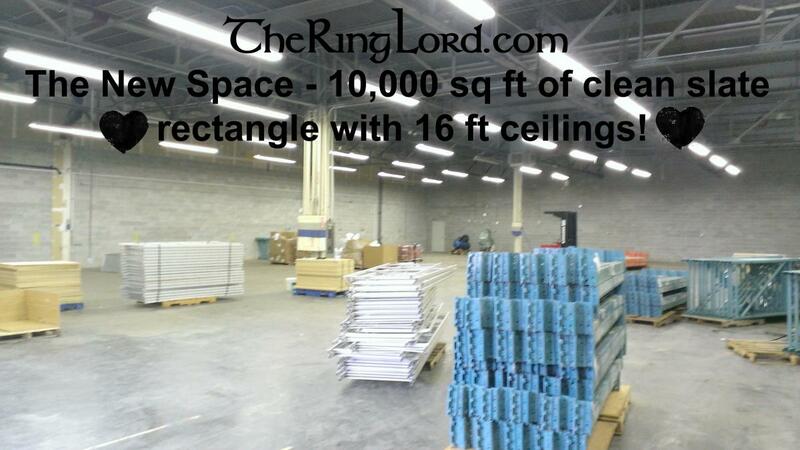 The new space is a 10,000 warehouse perfect for what we do. 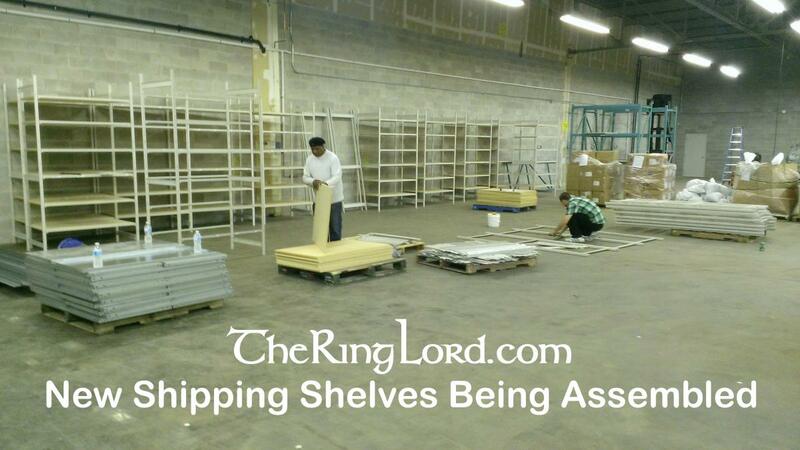 We're setting it up the way we need with the type of storage and shelving we need. It's an exciting fresh start on our facility layout and we expect some great benefits from that alone! I've attached a few in-process pics to show you the new space. There is a huge list of benefits - from little things like being around the corner from a bagging machine company instead of a 6 hour plane ride away, to having access to a larger workforce. I can't possible list them all - or know them all yet! All the changes we are implementing have been pondered for years. We've made our decisions multiple times (the same way each time) with care and awareness of consequences to ourselves, our staff and to our customers. Jon and Bernice will still be involved in managing TheRingLord - we just now have more operations help from Grant. Both Jon and Bernice will be training new staff and supervising all set up to make sure we're providing the best service we can to you. One of our current shippers, Andrew, is coming to Toronto to help us get orders shipped while we train new staff. Grant, and his current team, will still be making the saw cut bright anodized rings and bright anodized scales we love. Doug will still be operating all our punches, machine shop and ring machines to his usual high standard. Jon will still be scheming up new product lines - in fact with the new space we intend on really letting loose on this scheming! Bernice will still be improving the website, adding new products and designing new kits and instructions - again with the new space we intend on really letting loose on this scheming too! We've been throttling back for years on new products because of this space. As soon as the dust settles - it will take months - we intend to let release the brakes on new product ideas! First of all not everything is moving. Some production is remaining in Saskatoon. All of shipping and some of production is moving to Toronto. The exact split of what is where should not affect orders as everything ships from Toronto. This is the same as we've been doing for years - but in reverse. Toronto used to ship to us, then we ship to you. 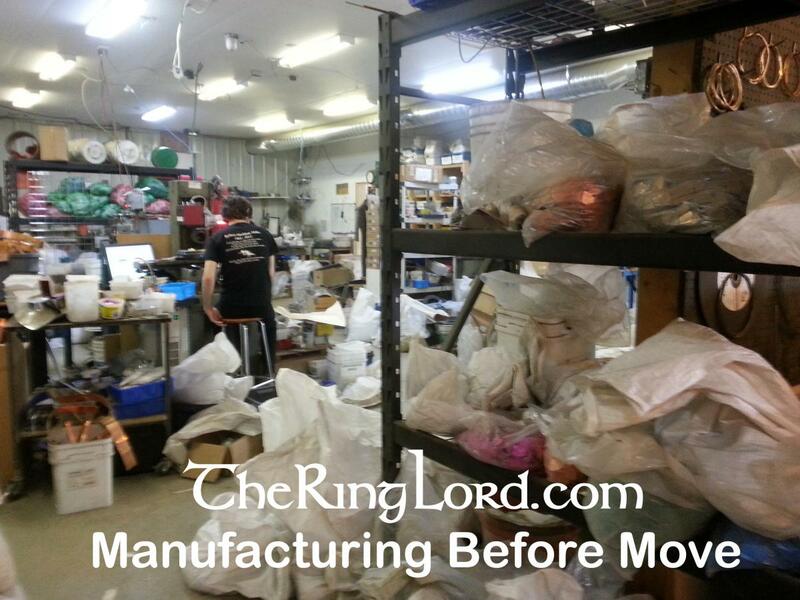 We will be packing up stock and machines that are moving in Saskatoon during the week of August 18-24th. It will be business as usual for shipping that entire week! We will be shipping all that week and doing our absolute best to get all orders out before we move. The last days of shipping from Saskatoon is Friday August 22nd. As soon as the trucks arrive (staggered on different days) we will be setting up our new much larger facility! The week of the 25th to the 31st is dedicated to shop setup. I hope you find this as exciting as we do . If you have any concerns please post or email and we'll be happy to address them. Sounds like a lot of work and a lot of thought went into all of this. So, hooray and congrats! Hoping that by next year sometime, you might allow "tours" of your facilities in Toronto, as we go to NY every year. An extra 2 hour drive would be completely acceptable to see my favorite place to shop in the world. Don't know if this is something you're willing to answer, but are there going to be job loss because of this? I'm hoping that the fact that some manufacturing is still taking place in Saskatoon that won't be the case. Glad to see growth for y'all, though, and VERY much looking forward to new products coming. Hope to see a bunch new aluminum and aa stuff! We are already planning /scheming tours options and such. We need the dust to settle before we start this. On this same note - people have been asking about being able to pick up orders in Toronto or a storefront. The answer for now is no there will not be a storefront and no local pickups will be offered. In future we will reconsider this. When the dusts settles on the number of people we employ it comes out basically the same. Over 1/2 of our staff will remain as the same people. This was the worst part of the move consideration of course and we gave it extra thought and planning. Will it still be possible to pick orders up here in Saskatoon? You only have a few days to place any you want to pick up and only a week left before all pickups stop. 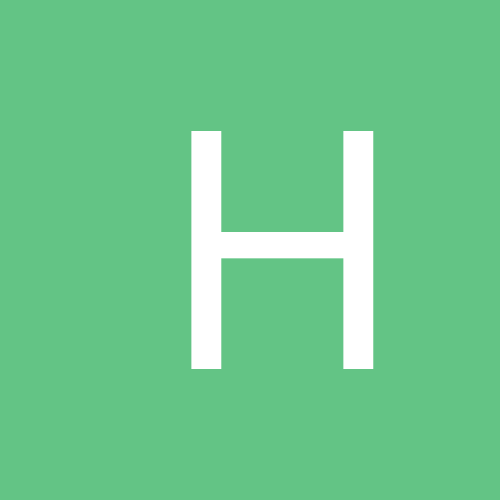 Can you (or have you already) post the new address? We are not offering local pick up and will be closed to the public for several months. So we have not posted the address yet. We will offer tours etc once we're settled. Tours?! Been wanting take another trip to Canada. Might have to consider the Toronto area this next time rather the BC. It would be great to see how you do things, so I'm looking forward to the time you're comfortable letting outsiders into the new location. I'm asking because I'm in a suburb that's prime for manufacturing and shipping, so you might well be headed my way (Brampton). If you do, then please make sure that you don't just stick around the city. There was a case recently in which a Brit and a Finn came to Canada and wrote an open letter to tell us how bad our car culture has messed things up but, from the sounds of it, they never went as much as an hour away from a major city. We've got some truly beautiful spaces here, but you'll need to drive for an hour or three in order to see the best of them. They also somehow seemed to have missed Toronto's Credit River Valley, that cuts from north to south right through the city, and High Park. More so if your taking the peace bridge. Lewis and queenston or the rainbow bridge often are much faster. These days Toronto traffic, period, is to be avoided. The downtown core is a mess, as are most routes leading into it. Organized chaos at it's best...which isn't to say I do any better, my work space is ridiculous! Congrats! And here's to more stuff, faster! Oh! Another reason to visit Canada!